Mining Equipment in South Africa: who is APT? Mining equipment in South Africa has taken on new heights with engineers and suppliers, APT. We have had many new visitors to our website and head office lately, but many do not know the extent of what we actually do. We thought we'd take this opportunity to introduce ourselves to anyone looking for mining equipment in South Africa and across the globe. Our CEO once stated "we do not simply provide mining equipment, we provide solutions to problems faced in the industry". 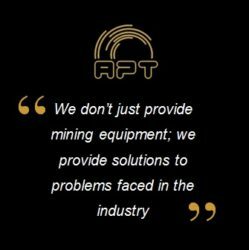 This sums up APT; we set out to innovate, create and inspire in taking care of the whole mining equipment process from mineral testwork to concept creation to engineering, research and development, manufacture, assembly and finally on-site mining installation and commissioning. It sounds like a long process, but we are known for keeping our lead times short. Our head office is based in Johannesburg, South Africa. Here you can see our mining equipment in these various stages, some being designed, some being manufactured and others being checked one last time before disassembly and their subsequent journey to site. We set out to show you this through the videos below and give you a solid vision of APT. We also keep things affordable and simple; if you're looking for an alluvial gold recovery plant, we have it and the same goes for hard rock plants and so on. We have a variety of plant sizes available even if it's for the more advanced designs such as our CIP/CIL cyanidation plant, the TriTank, which has received great praise for being entirely new to the industry and well ahead of anything else out there today. So with APT you may be starting off smaller, but that just means a greater profit in a shorter time-frame. Our 'Let Your Project Fund Itself' article reflects this ideology. That said, we also do the not-so-standard plants and really put in the extra work to ensure that we create the best one suited to your site. We keep things minimal, sturdy and bold. We are proud of our team and our team proud of what they produce. This pride is reflected in our plants and seeing them on your sites around the globe is truly rewarding! We welcome you to step into our offices, have a cup of coffee or whatever your preference and look out over our deck onto all of the plants being created while we talk all things mining. It really is inspiring! Email us on info@aptprocessing.com to arrange an appointment or visit our contact page for directions to the offices. Newer PostMining Equipment Out this Week & Phone Number Change!